We happened to be in Kathmandu on the Nepali New Year. 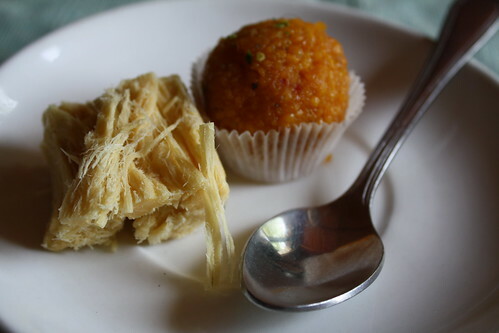 To celebrate, our hotel served up plates of beautiful Nepali sweets. Here we were introduced to the desserts gulab jamun and sohan papdi. Gulab jamun, also known as “waffle balls,” is a popular dessert in countries of the Subcontinent such as India, Pakistan, Nepal and Bangladesh. The overly-sweet dessert is made of a dough consisting mainly of milk and is soaked in a sugar syrup and flavored with cardamom seeds and rosewater or saffron. Also popular throughout the Subcontinent, sohan papdi is square in shape, and has a crisp and flaky texture. When flavored with almond, as it was above, it’s particularly scrumptious and melts in your mouth. @Megan – Absolutely concur on the monotony of Nepal food! We were excited to find they actually had some sweets to offer – a welcomed change from the momos and dhal bhat. Enjoy your visit back to Nepal! Oh yum! I never saw these desserts when I was in Nepal a couple of years ago – it was all momos or scrambled eggs and potato curry – good thing I’m going back, will have to look out for them!